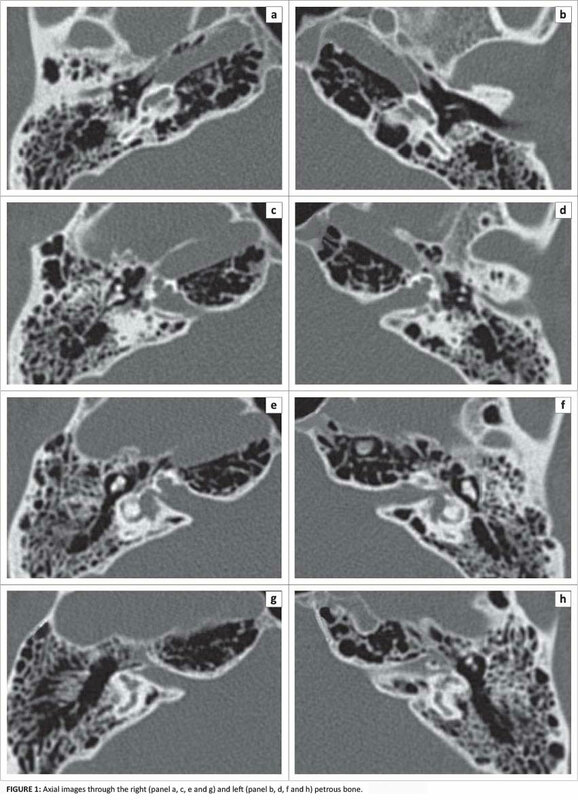 A 46-year-old man presented to the Department of Otolaryngology with congenital deafness of unknown cause. With the help of hearing aids (which did not provide any speech understanding in the sound-only condition) and by mastering speech reading, he had learned to speak quite fluently at a school for deaf and hearing-impaired children. Despite these capabilities, he came to seek advice about cochlear implants, as he would like to communicate more conveniently with his family, of whom none had significant hearing loss. On physical examination, he was completely deaf and had adapted to major vestibular deficits (i.e. bilateral vestibular areflexia). The following CT scan of the petrous bone (Figure 1) and MRI images of the cerebellopontine angle (Figure 2) were obtained.